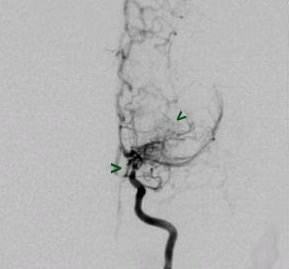 Cerebral Angiogram : Left Internal Carotid Artery injection (AP view) show stenosis involving cavernous portion with prominent collateral vessels giving puff of smoke appearance of Moyamoya disease, a rare idiopathic disorder characterized by progressive narrowing of the distal internal carotid arteries and their branches. It is typically seen in children, although rarely reported in adults. As the carotid artery is compromised, there is progressive enlargement of the collateral circulation, especially among the lenticulostriate vessels. This results in a characteristic angiographic picture of a blush or "puff of smoke" in the area of the lenticulostriate vessels. Typically presents with recurrent infarcts where as in some cases, the fragile collaterals can rupture resulting in intra cranial bleed.